PLOT: Thirteen-year-old Lili fights to protect her best friend Hagen and is devastated when her father forces Him onto the streets. Innocently believing love can conquer all, Lili sets out to find and save him. White God is a tragic tale of Lilli and Hagen. Lilli is a thirteen year old girl forced to live with her estranged dad, whilst her mum spends three months on business in Australia. Hagen is her illegal immigrant boyfriend. When Lilli’s father refuses to put Hagen up he is left to fend for himself on the streets of Budapest and is brutalised by the wickedness of the seedy underworld. Whilst Lilli searches day and night for Hagen, he is quickly corrupted by life on the streets and is forced into illegal prize fighting. He meets a large number of other immigrants and when he is eventually thrown into an internment camp, he leads a bloody uprising that sees hundreds of illegals roaming the streets causing chaos and panic for the locals. With the aid of an elderly immigrant that had befriended Hagen, Lilli must track him down and bring an end to the uprising before the violence gets out of hand. Except it isn’t. If you replace the words illegal with ‘unregistered’, immigrant with ‘dog’ and boyfriend with ‘pet’ then the above paragraph becomes true. White God is a remarkable film that takes a serious subject lightly, but manages to keep all of the authenticity and impact without resorting to Disney style animal tricks. The uprising of ferrel dogs against the ‘White God’ is not only believable, it s stunning to watch. The performances of the lead animal actors (Hagen is played by two different trained dogs) is so stunning that you believe in his terror, anger, love and hate. As the film’s cast is made up of about a dozen humans and over 250 dogs, it becomes a thing of beauty when all of the canines are rampaging through Budapest. Every one of the dogs is a cross-breed and there is not one bit of CGI in the whole film. This is a testament to Director Kornél Mundruczó who has managed to keep to the wonderful story without veering into glamour, horror, or puppy love. Whilst you feel for the animals in the film, you would most certainly be afraid of them too. White God is one of my favourite films of the year and easily the best foreign language film I have seen in a long time. If you have the patience for subtitles then I urge you to give the film a go. 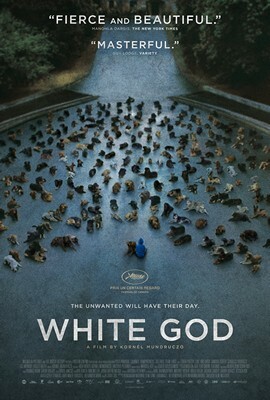 White God sees 250 dogs marauding through Budapest in a surprisingly beautiful and equally terrifying tale of the weak uprising against an oppressive state.